I came across the quote in the picture below and it made me think, A LOT, so I googled it. Once I read the actual quote from the book in context, I felt an obligation to Lewis Carroll to include that here before going into my thoughts. I haven’t blogged in WAY too long, especially not a post that shared my own words. This quote has inspired me to take the time to do so. It’s funny how much I feel like I change on a daily basis. Not until I read this quote did it hit me how much I have changed since I woke up this morning and it’s not even noon yet. I sometimes feel like we have this view of ourselves that we think cannot change. Either we are worried what others will think or we are just scared that it will stray away from our own expectations of ourselves. It’s impossible not to change though and I think it’s important to remember that it’s inevitable and that we have to embrace our identity as we change and grow. It’s a beautiful thing to know that we are able to morph like this, sort of like caterpillars do. It’s also important to remember that we need to be careful what our expectations are of those around us. 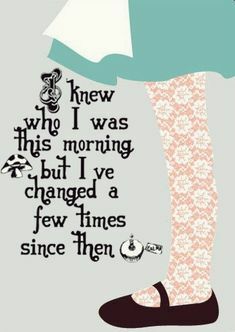 They change daily too, you know, and we have to accept that as well. Allow them to do so and accept their process as you do your own. As I get older I actually feel myself change as it happens. It’s hard to explain the feeling but it’s like a tiny “a-ha” moment that sends this little charge throughout my body. It’s enlightening and refreshing to feel this happen. I think it’s one of the most important jobs we have as individuals, to be self aware, and to accept that we are changing every moment of every day as we grow and learn more about ourselves and this world. Who am I? Well, it’s hard to say, I’ve changed several times since I started this blog 😉 You?